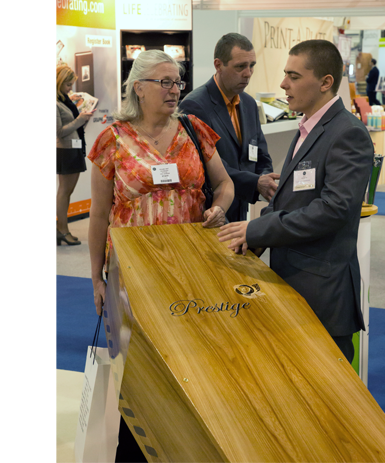 Launched at the national funeral exhibition June 2013 Greenfield Prestige is a modern approach to the increased demand for environmentally friendlier coffins and more personalized funerals. But our customers have often asked, can you remove the joints? Can you make theses in more sizes? Can you remove the lip on the lid? Can you provide a fully biodegradable lining suite that’s tailored to the coffin? While others have questioned, why don’t your wood grains look like wood? Why would you have a cardboard coffin then add a wooden charger board? Why are the fixings for the lid a one hit wonder? At the NFE 2013 we believe we provided an answer to all your queries and are very proud to present Greenfield Prestige Ltd. While passing our stand many people were stopped in their tracks by these new coffins, even asking where our cardboard coffins were. Click here to register as a Prestiege reseller.